Granite City Food & Brewery is hosting a Father's Day brunch! It's the perfect way to say "Happy Father's Day." 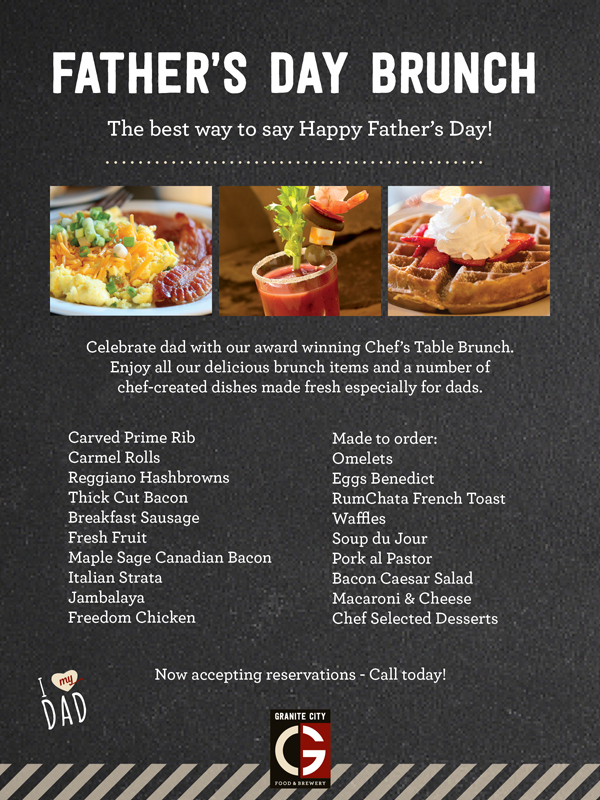 Celebrate dad with our award winning Chef's Table Brunch. 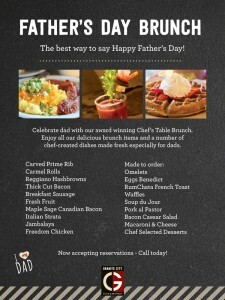 Enjoy all our delicious brunch items and a number of chef-created dishes made fresh especially for dads. Brunch buffet menu includes: Carved Prime Rib, Caramel Rolls, Reggiano Hashbrowns, Thick Cut Bacon, Breakfast Sausage, Maple Sage Canadian Bacon, Italian Strata, Jambalaya, Freedom Chicken, Soup du Jour, Pork al Pator, Bacon Caesar Salad, Macaroni & Cheese. As well as "Made to order" items that include: Omelets, Eggs Benedict, RumChata French Toast, Waffles... and chef Selected Desserts! Now accepting reservations - Call Today!